There are four extended narratives of around 80 frames each here, which I guess would have run for about three months each in 1961. 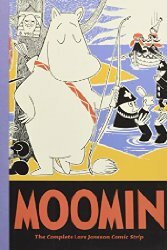 The first is "Moomin the Colonist", a story of colonialism which would have been inspired by the winds of change; the Moomins settle a new continent and come into conflict with their neighbours (who are in fact their old neighbours from Moominland, also attempting colonisation) - the indigenous inhabitants are barely seen. The other three, "Moomin and the Scouts", "Moomin and the Farm" and "Moomin and the Goldfields" are all faintly surreal but not all that adventurous. I bought this collection when I went to the Adventures in Moominland exhibition in January, and am actually a bit miffed - I should have spotted that it is not by Tove Jansson but by her brother Lars, and on checking inside it turns out to be the seventh of ten (so far) collections of the Evening News comic strips about the Moomins, of which only the first four contain Tove Jansson material. Next time I have a chance I shall try and get one of the earlier volumes. This was my top unread graphic story on LibraryThing. Next in that list is The Autumnlands, Vol. 1: Tooth and Claw, by Kurt Busiek.